If you have accessed this page, it means our site is interesting for you and you wanted to know more about people who lead this portal and why they do it. 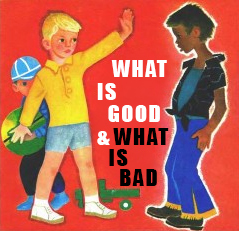 The main purpose of the “What is good” project is to increase morality in our society. Sounds global?? So the question is: how to do it? Demonstrate to the reader how media and modern mass culture control people. Develop awareness among readers about media from the perspective of question “What does this teach us?”. Create a platform to bring together all who are in favor of traditional family values. This site was created not only as a news media, but also as a structured database, which already now allows you to find analysis of famous movies, songs and books. Getting to know them will give you a fresh perspective on these information SOURCES and realize the impact they have on you (positive or negative), and what exactly that influence is. This site does not aim to demonstrate only the negative aspects of today’s culture. Of course, there are many pieces of art, which “teaching good” and have a positive impact on society’s life. Such materials on the site are in the “Good” section. As a model of moral standards defines the criteria of “good” and “bad”, editors and writers oriented to traditional family values: loyalty, love, hard work, respect for elders, the sanctity of motherhood, mutual aid, kindness, healthy life style, honesty, generosity, responsibility. Attention! Many of the articles reveal the details of the plot of movies / cartoons.